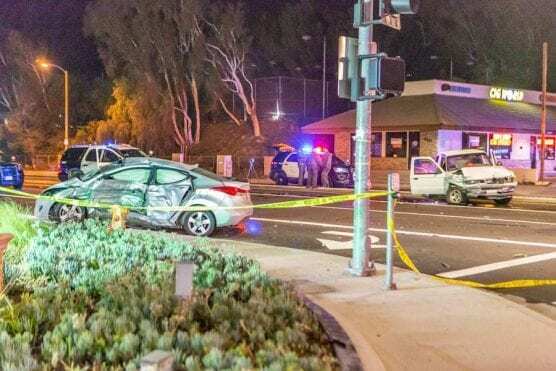 On Monday, at approximately 11:24 P.M., Santa Clarita Valley Sheriff’s Station was notified of an injury traffic collision involving three vehicles, a pickup truck and two other vehicles. Deputies, Fire and EMS personnel responded to the scene at the intersection of Soledad Canyon Road and Sand Canyon Road in Canyon Country. Upon arrival, officers located a Ford Ranger pickup, Hyundai Elantra, and Toyota Prius which had been involved in the collision. Preliminary indications are that the driver of the Ford Ranger pickup truck, 20-year-old Joshua Austin of Santa Clarita, was traveling westbound on Soledad Canyon Road, when he failed to stop at a red light, and collided with the driver’s side of the Hyundai Elantra. The driver of the Hyundai Elantra was pronounced deceased at the scene. The driver of a third vehicle, a Toyota Prius, that was involved in the collision was transported to the hospital with minor injuries. The driver of the pickup truck, Joshua Austin, was detained at the scene by deputies, and arrested on suspicion of driving under the influence. Anyone with information regarding this collision is encouraged to call Detective Cramer of the Santa Clarita Valley Sheriff’s Station Traffic Office at (661) 255-1121 ext. 5111. You can also submit information through LA CrimeStoppers at 1-800-222-TIPS (8477), or by using the website www.LACrimeStoppers.org. My heart aches. Rest easy beautiful queen..